Someone pointed out to me that having Sun Kissed Boy #2 helping me re-do The Terrific Turquoise Dresser made it all that more special. That got me thinking about the things I love in my house for purely sentimental reasons. Let's take this dresser. My mom bought this dresser for me from a garage sale when I was in high school. It was a bright yellow but it held my clothes so I didn’t think much of it. When my husband and I moved in together, we painted black and used it as a buffet. While we were painting, he painted our initials in a heart on the back of the dresser (awh, young love!). That stamped it in my heart forever. When we moved the dresser to the office/spare bedroom/computer room/Wii room, we repainted it once more. At that point, we traced the Sun Kissed Boys' little hands. 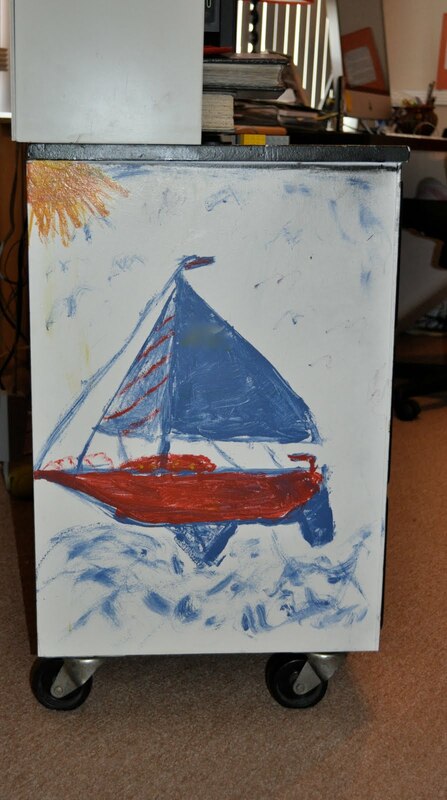 BTW, when we painted the dresser for Sun Kissed Boy #1, Sun Kissed Husband and I painted a sailboat on each side of the dresser. He painted one side, I painted the other. When we repainted it black again, Sun Kissed Husband couldn't bare to paint over his work of art, so he left it. I'm glad he did. I am sure when I redefine the office/spare bedroom/computer room/Wii room for one single use, the dresser will be painted again. And I am sure that we will stamp it once more with something else sappy to make me love it all the more. 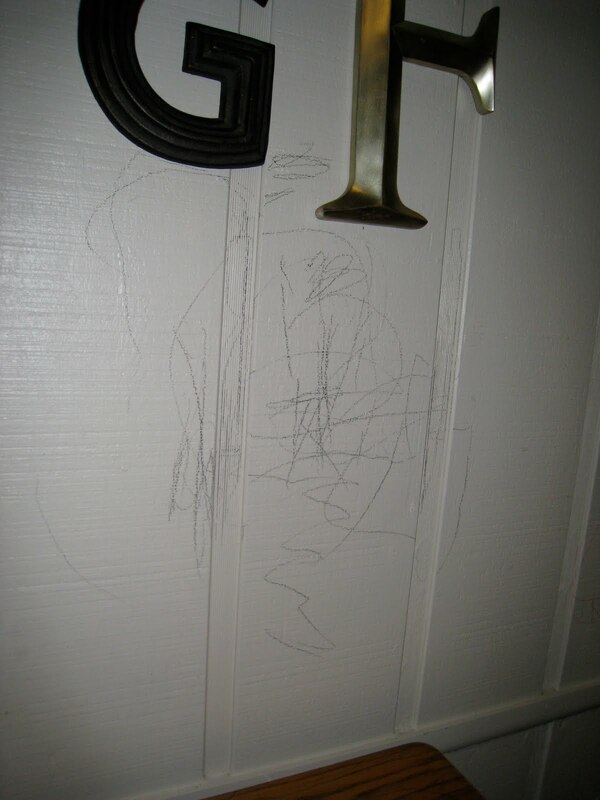 Another little sentimental thing is Sun Kissed Boy #2’s little handprint on one of our walls. I didn’t have the heart to paint over it so there it sits as if it was wall art. Sun Kissed Boy #1 leaves his mark in a less “cute” way. My Sunny Days step stool has his mark already! He stepped on some paint I had out while working on a project. My bad. In case you’re wondering, Sun Kissed Boy #1 had his share of wall painting but had outgrown it when we moved into our current home 4 years ago. Hew! I don't think I could part with that dresser, either! I'm way too sentimental. I love all the sweet touches your boys have left on your home. What a great way to record life. Way better than a wall, from which you move or remodel or repaint. Great idea created from randomness. How sweet-a true piece of art for sure. What a sweet sentimental story! I love the last one with the foot prints - looks like it was meant to be! That dresser is already a family heirloom, I'd say! I love this! You are so talented and I love how you integrate your children into each piece of furniture you create! Another lovely link to Alphabe-Thursday's letter "S"! i LOVE that you left the handprint on the wall. that's such a cute thing! 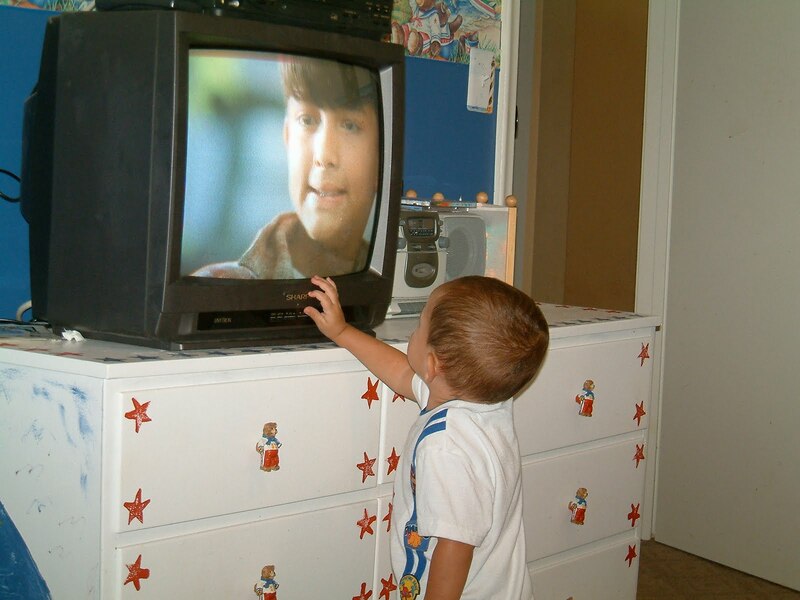 we should do that in my parents' house with their grandbabies. What a treasure you have! And the dresser is pretty neat, too! When my ds was 2 he left a hand print on the inside of the car windshield. Dh cleaned around that hand print for 15 yrs. You could see it pretty clearly for at least 12 yrs - after that it was really just a very dirty spot. LOL Still, dh cleaned around. A few weeks ago he wrecked the car. My first thought - after I knew he was ok - was the hand print. The windshield shattered so it's gone. The memory is there though & our son has watched his dad treasure that print all these years.